It took more than an hour from the first call to police to the point where a SWAT team blew up the door to the hotel room of Stephen Paddock, the shooter who killed at least 59 and wounded over 500 on Sunday, Oct. 1. At 10:08 p.m., the police received the first call about shots fired at Route 91 Harvest country music festival on Las Vegas Boulevard. People heard the shots, but it wasn’t easy to discern where the shots were coming from. Around 15 minutes after the first call, police received the first indication the shooter was possibly in room 135 on the 32nd floor of the Mandalay Bay Resort and Casino, a large hotel diagonally across the street from the concert venue. A minute later, someone requested through police radio a SWAT team to get to room 135. About two minutes after that, the hotel security reported shots fired at the 29th and 32nd floors. A security guard was shot in the leg, according to the police scanner recording. Police started searching on the 29th floor and then moved up. When they got on the 32nd floor, they said they immediately knew it was the right one, according to NBC News. It is not clear how they knew. About an hour and 11 minutes after the first call, the SWAT team was about to blow up the doors to the room 135. “We have sight on the suspect’s door. I need everybody in that hallway to be aware of it and get back. We need to pop this and see if we get any type of response from this guy to see if he’s in here or if he’s actually moved somewhere else,” an officer reported on the radio. Fifteen seconds later an officer said, ‘breach, breach, breach’ followed by an explosion. Paddock was found dead inside. Police said he shot himself. According to police, Paddock, 64, of Sun Valley, California, acted alone. His motive is unknown. 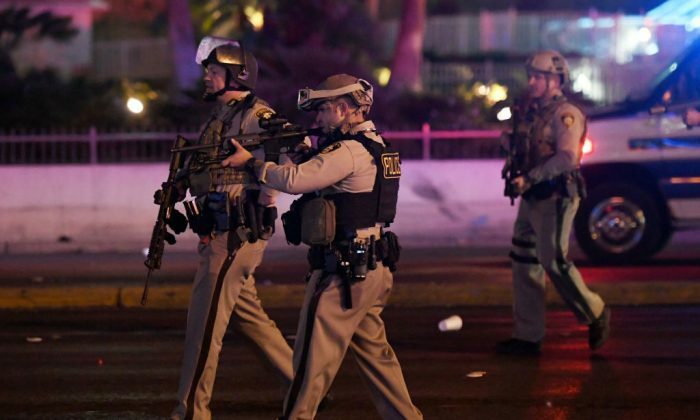 Details on the attack are still emerging, but according to former FBI agent Marc Ruskin, the sound of the gunfire strongly suggested Paddock was using an illegal automatic weapon.